April 08, 2014, ARLINGTON, Va. (NNS) – Navy engineers are making final adjustments to a laser weapon prototype that will be the first of its kind to deploy aboard a ship late this summer. 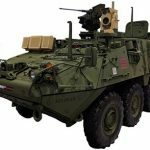 The prototype, an improved version of the Laser Weapon System (LaWS), will be installed on USS Ponce for at-sea testing in the Persian Gulf, fulfilling plans announced by Chief of Naval Operations Adm. Jonathan Greenert at the 2013 Sea-Air-Space Expo. Navy leaders have made directed-energy weapons a top priority to counter what they call asymmetric threats, including unmanned and light aircraft and small attack boats that could be used to deny U.S. forces access to certain areas. High-energy lasers offer an affordable and safe way to target these threats at the speed of light with extreme precision and an unlimited magazine, experts say. 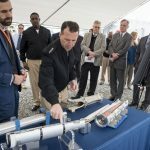 Klunder leads the Office of Naval Research (ONR), which has worked with the Naval Sea Systems Command, Naval Research Laboratory, Naval Surface Warfare Center Dahlgren Division and others to make powerful directed-energy weapons a reality. The Navy already has demonstrated the effectiveness of lasers in a variety of maritime settings. In a 2011 demonstration, a laser was used to defeat multiple small boat threats from a destroyer. In 2012, LaWS downed several unmanned aircraft in tests. Over the past several months, working under the ONR Quick Reaction Capability program, a team of Navy engineers and scientists have upgraded LaWS, and proved that targets tracked with a Phalanx Close-In Weapon can be easily handed over to the laser’s targeting and tracking system. The result is a weapon system with a single laser weapon control console, manned by a surface warfare weapons officer aboard USS Ponce who can operate all functions of the laser-and if commanded, fire the laser weapon. Using a video game-like controller, that sailor will be able to manage the laser’s power to accomplish a range of effects against a threat, from disabling to complete destruction. The deployment on Ponce will prove crucial as the Navy continues its push to provide laser weapons to the fleet at large. Data regarding accuracy, lethality and other factors from the Ponce deployment will guide the development of even more capable weapons under ONR’s Solid-State Laser – Technology Maturation program. Under this program, industry teams led by Northrop Grumman, BAE Systems and Raytheon Corp. have been selected to develop cost-effective, combat-ready laser prototypes that could be installed on vessels such as guided-missile destroyers and the Littoral Combat Ship in 2016. 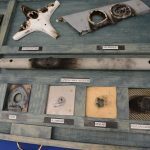 The Navy will decide next year which, if any, of the three industry prototypes are suitable to move forward and begin initial ship installation for further testing.